"Is it me?" wondered the lonely stove. "Why do all the other appliances avoid me? Do I offend?" And with that thought, it went off to run its self-cleaning cycle. Looks like the water in the pool ran off too. It was probably that purple paint that scared everyone! Gives a whole new meaning to "Free Standing Range/Oven". this is even more funny to me because the listing says there are "temporary cabinets in place" in the kitchen. maybe they are invisible cabinets. 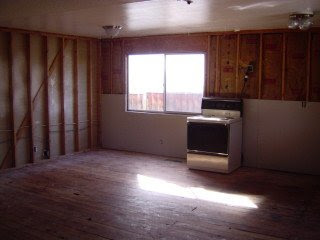 I had a kitchen like that once, only with a much nicer stove. HAHAHAHA!!!! Okay, for real, that made me laugh out loud and even slap my knee. Po' liddle stove.. he just needs a buddy. Look at the house now.. They really did a great job!